How about using a BOB trailer on your next big bike trip. 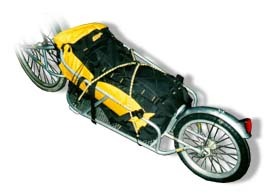 The BOB Yak trailer is a great alternative to the traditional rack and pannier setup. The trailer fastens to a special quick release that replaces the QR skewer in your own bike. This makes it easy to attach and detach the trailer with no fear of damage to your frame. For more info on BOB trailers visit their web site at: www.bobtrailers.com. I still feel that variable gears are only for people over forty-five. Isn't it better to triumph by the strength of your muscles than by the artifice of a derailer? We are getting soft... As for me, give me a fixed gear!